Do you have any funny memories when you were frustrated about a situation, only to realize that it was you to blame all along? All too often when things blow up in our lives, we look around to see who caused it. But many times, we are the ones to blame. 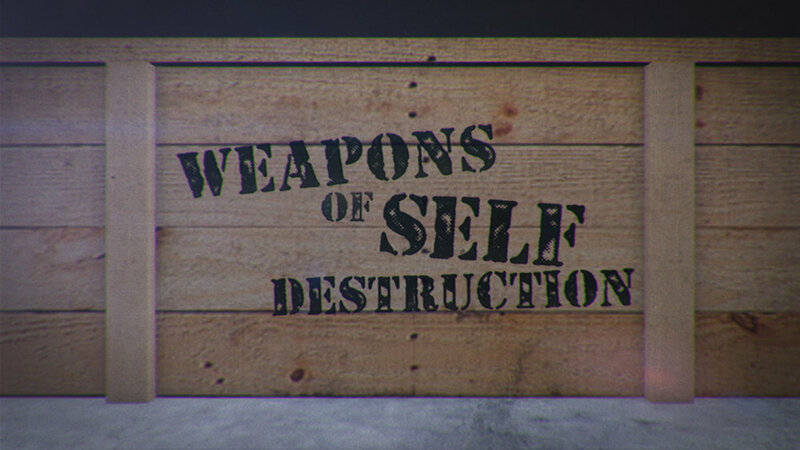 Our first weapon of self-destruction this month was pride, the weapon that is at the foundation of all our lives. Whether it's thinking too highly or too lowly of ourselves, pride plagues at all - and the only way through it is to start letting God define our significance. Jake asked us to think about the human being we thought of most over the last week - even though we all know the answer. How do you normally evaluate your own worth? What things about you do you find yourself trusting to give you worth, significance, and meaning? Do these things normally build you up, or end up deflating you? What skills, talents, or circumstances do you tend to feel you earned rather than thinking of it as a gift from God? What effect does that type of pride have on yourself and your relationships? Jake said that another form of pride is inferiority, where we deflate our egos by consistently devaluing ourselves. Why is it so important to know that inferiority is another form of pride? Do you lean toward feelings of superiority or inferiority? Or do they feed into each other at times? 1 Corinthians 4:3-4 says "As for me, it matters very little how I might be evaluated by you or by any human authority. I don’t even trust my own judgment on this point. My conscience is clear, but that doesn’t prove I’m right. It is the Lord himself who will examine me and decide." Whose opinion influences your opinion of yourself? How does it that affect your everyday life and the decisions you make? When what I think about myself is the most important thing, it means that I’m setting the standard of what’s good enough for myself. Do you usually set the bar too high or too low for yourself? Romans 8:1 says “So now there is no condemnation for those who belong to Christ Jesus.” We are not on trial anymore, we have nothing to prove to God, and He has freed us from the burden of Inflating our own egos. Is it hard for you to accept or believe what God thinks of you? When what God says about us is the most important thing, we are free to live a life of self-forgetfulness. If you didn’t spend all your time thinking about, worry about, and fighting for yourself, what would you be able to focus on? How would self-forgetfulness change how you live? Read the story of King Nebuchadnezzer of Babylon from around 600 BC, who experienced his life crashing around him because of his pride. Use this prayer to kickstart your own personal prayer this week. Father, I can be obsessed... with me. Whether I'm inflating or deflating my own ego, my mind is so often centered on myself. I want to believe what you say about me is true. I want to believe that your grace has covered my sin, that it has given me hope and purpose for the future. Help me think of myself less so I can be ready to respond when you lead and guide me. So often, our prayers are filled with the things we think are most important - and it's usually ourselves. This week, pick a few people to pray for regularly. Pray for them to have joy. Pray for them to get promoted. Pray that they can know and trust God in a new, deeper way. Practice self-forgetfulness as you pray, knowing that God is still caring and providing for you.